In ITER, scientists will use over 50 diagnostic systems to accurately "read" the plasma and furnish information that is important to its control, evaluation and optimization. All seven ITER Domestic Agencies are involved in the development and procurement of these systems, some of which will have to be installed and operational at the time of the project's First Plasma in 2025. Unboxed, installed, tested and ready for experiments: the prototype Fourier Transform Spectrometer at the ITER India lab. As part of its contributions to ITER diagnostics, the Indian Domestic Agency will be supplying several sub-systems of electron cyclotron emission (ECE) diagnostic systems, designed to measure local electron temperature with high spatial and temporal resolution. One of these—a Fourier Transform Spectrometer—will be used in particular to measure the power loss from the ITER plasma due to ECE radiation and to study the non-thermal electrons in the plasma. R&D and experimental activities are currently underway at a dedicated ITER India laboratory in Gandhinagar (western India). 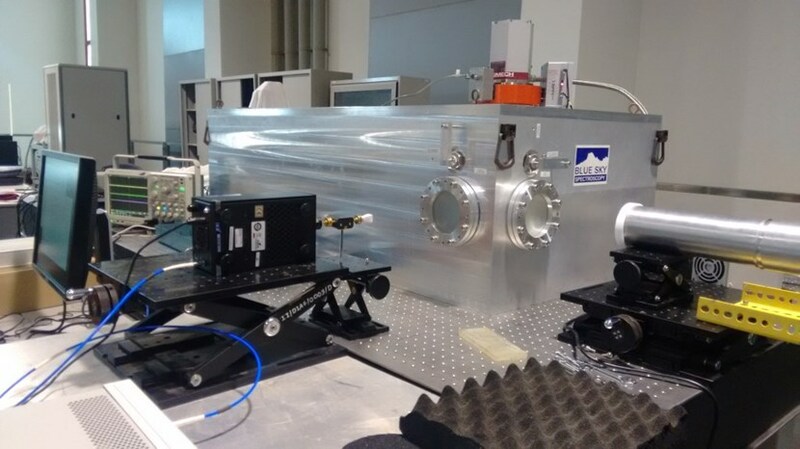 A prototype of the fast-scanning Fourier Transform Spectrometer (FTS), based on requirements specified by ITER India, was manufactured by Blue Sky Spectroscopy Inc., Canada. This prototype has been installed at the ITER India laboratory where post-installation acceptance tests have been carried out and found satisfactory. Based on a polarizing Michelson interferometer (70-1000 GHz), this fast-scanning Fourier Transform Spectrometer also consists of a cryo-cooled, dual-channel Tera-Hertz radiation measurement detector system. Experiments will be carried out to test attenuation in transmission line components; the results obtained will be instrumental in providing input for the design of an ultra-wideband (70-1000 GHz) transmission line for the ITER ECE diagnostic system.